Happy Friday! We have finally made it to the middle of November, which means that Christmas is right around the corner! In our house we wait to decorate until Thanksgiving weekend. On Saturday or Sunday we’ll head to the mountains, with cups of coffee and hot chocolate, and cut down our Christmas tree’s. After that, the Christmas decorating and fun begins! It’s my favorite time of the year, and right now I’m itching to get all my Christmas décor out. White I pationetly wait I decided to get my Christmas fix by creating a Christmas wedding storyboard. 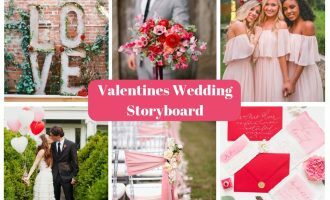 When I plan weddings for my amazing couples, a storyboard is where we start. I sit down with the bride and groom and talk about the feel and vision they have in their heads for their big day. After our initial meetings and phone chats, I come up with a storyboard to showcase all the design elements and vibe for their wedding. It’s a starting place and something that helps my clients see exactly what I’m talking about and the feel we’re trying to achieve. We don’t take every item and replicate it, a storyboard is more for the overall esthetic feel and color palette for the wedding. It is also a big help for showing the vendors you are working with, so everyone is on the same page and they can fully envision the celebration. I love this storyboard so much, so without further adieu, I can’t wait to share with you this months Christmas wedding storyboard! Image Sources // 1. // 2. // 3. // 4. // 5. // 6. 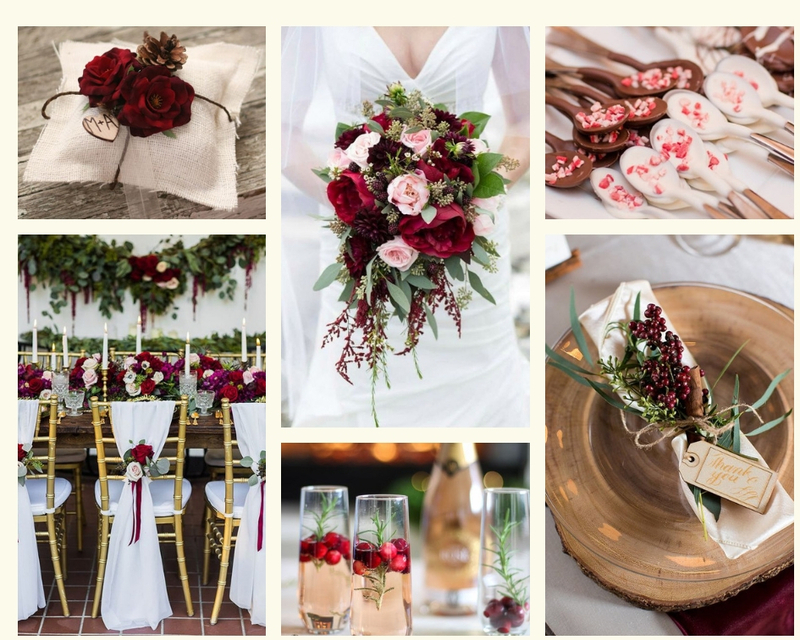 For this Christmas wedding storyboard, I started with the primary colors, deep red and green and added white, gold and blush pink as the secondary colors. 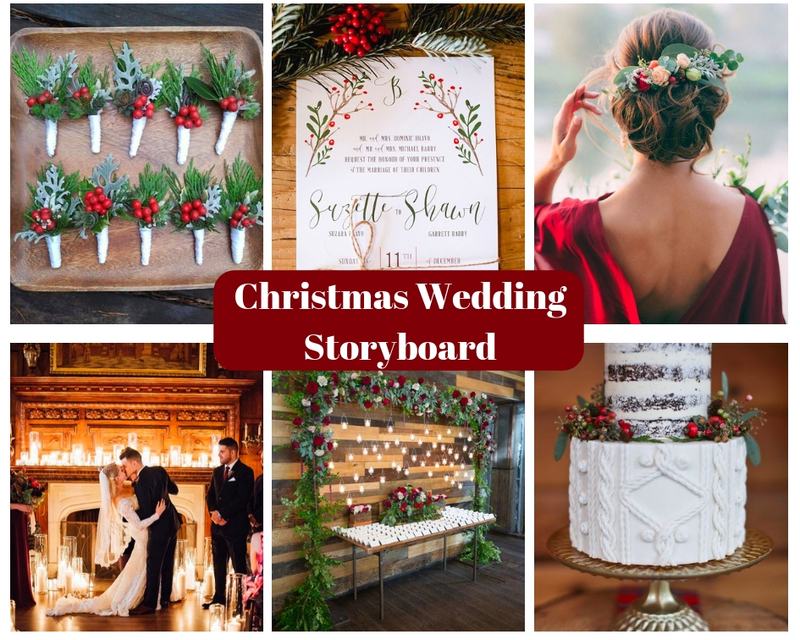 I wanted this storyboard to give the feeling of an intimate indoor celebration surround by family and close friends with snow falling outside. Some of the details that I added to give off the warm and cozy vibe were all the candles at the alter, the cable knit detail on the wedding cake, family style tables for dinner and chocolate covered spoons for guests to make hot chocolate as desert is served. I had so much fun making this storyboard, I’m planning on making it a monthly series! I will be designing the storyboard around the changing seasons and color. My hope is that these inspire you and can be used when planning your own wedding. Each storyboard will feature a color palate, floral designs, stationary, cake designs, drink and food ideas, tablescapes and place settings. Use a small portion or the whole thing, it’s completely up to you! My hope is that they inspire you and help the wedding planning process not feel so daunting. If you would like to see more wedding inspiration check out my Pinterest page. I even made a specific board for Christmas and winter weddings! If you are getting married and would like me to create a storyboard around your wedding ideas, let me know! I would love to come up with one for you and show it here on the blog!